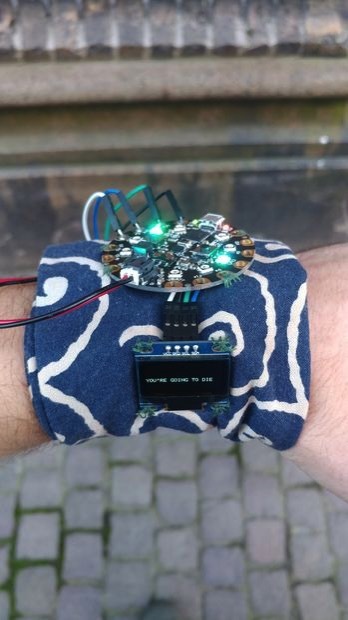 Deathwatch — Wearable Life Expectancy Timer Using Adafruit Circuit Playground + OLED #WearableWednesday « Adafruit Industries – Makers, hackers, artists, designers and engineers! Here is a somewhat morbid project shared by DeadAugust on Instructables. What are you going to do with the time you have? In short, it’s a wrist-worn Adafruit Circuit Playground that displays a randomly generated (but statistically informed) number of days I have left to live. Fun! Basic premise is: it operates on code that randomly generates these days based on an actuarial table I found that gave me the probability I would die in various age blocks. So every now and then it’ll change — one day it’ll say I have 23,454 days left, another only 19. And it’s all on a randomized timer as well, so I never know when it’ll change, allowing it to catch me off guard and hopefully make me shift perspective in that moment and internalize that life expectancy. Check out the full guide! !